Anyway, with all my scrimping and saving, I have come to appreciate the wonders of the store cupboard. 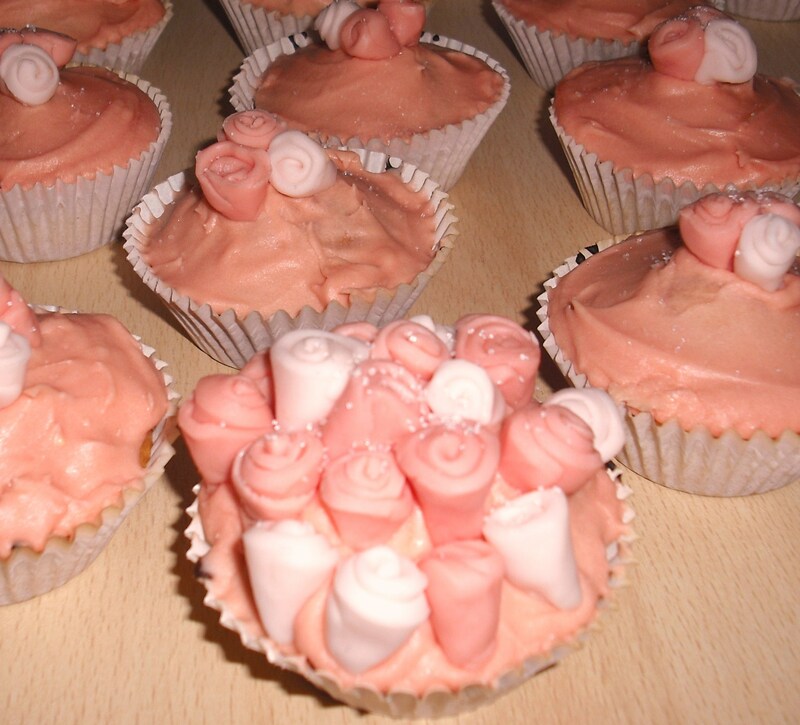 When I came home from uni and started all of my baking, the one thing that made everything much easier and cheaper was the store cupboard (cheaper for me, perhaps not for my parents 😉 ). When you live somewhere permanently, you buy in all the useful everyday cooking essentials like olive oil, herbs, flour, sugar, salt, etc. and use them up bit by bit. However, when you know you’re only going to be staying somewhere for a couple of months, and will not be able to take anything you’ve got leftover back with you, those store cupboard essentials tend to be overlooked. They’re expensive to buy if you’re not going to get the chance to use them all up and you tell yourself you can survive without. 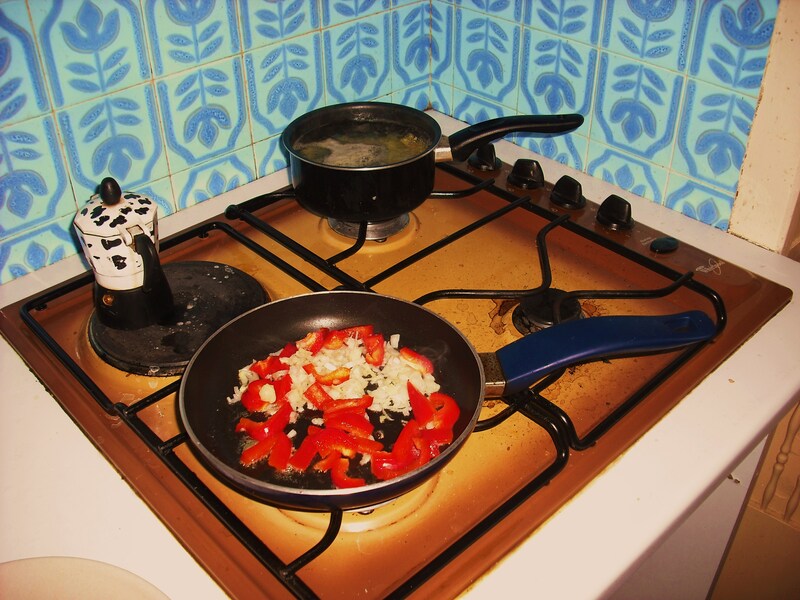 Cooking just isn’t as fun without a store cupboard. Especially as food shopping really isn’t my thing. I’ve been going after work, which is the worst possible time. Never go shopping when you’re hungry! I get home with an assorted mix of ingredients that don’t really go together, but which were all cheap and tasty enough individually for me to give in and buy them. Cheese, crisps, sweets, biscuits… No meal potential whatsoever. But the other day, I realised – miraculously – that I could actually make a half decent Spanish omelette with the assorted items in my fridge. Some potatoes, eggs, a slightly withered shallot and a pepper. Now I love Spanish omelettes… they’re so filling and there’s something very comfort food-y about them, but you can whack in a few more healthy ingredients so you can tell your mum/grandma/other concerned relative that, yes, you have been eating your vegetables. Then came the dreaded flipping, which is made so much easier with a non-stick pan! I’m not sure how the pros do it, but I flip it onto a plate, flip it onto another plate & then flip it back into the pan again. All with the help of a tea towel of course! Looks perfect. We lived in Spain for 12 years and I’ve made more than a few of those things– homey and comfortable and delicious. Fun to see you post! 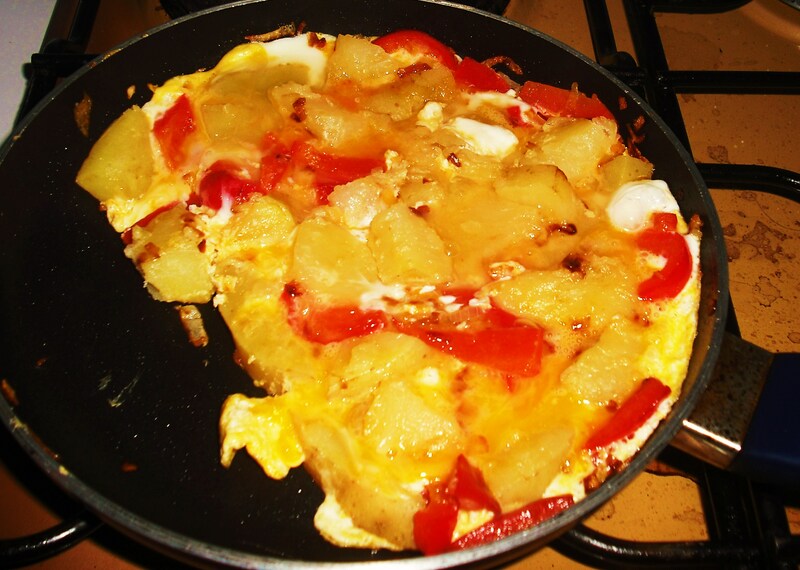 I’m spanish and I am surprised to discover this omelette… Hahahaha ot looks delicious but the “original” Spanish omelette is only made with eggs and potatoes. Sometimes, we also add onion. It’s true that there are a huge variety of Spanish omelette (With pepper, mushrooms, ham…) and all of them are really tasty. 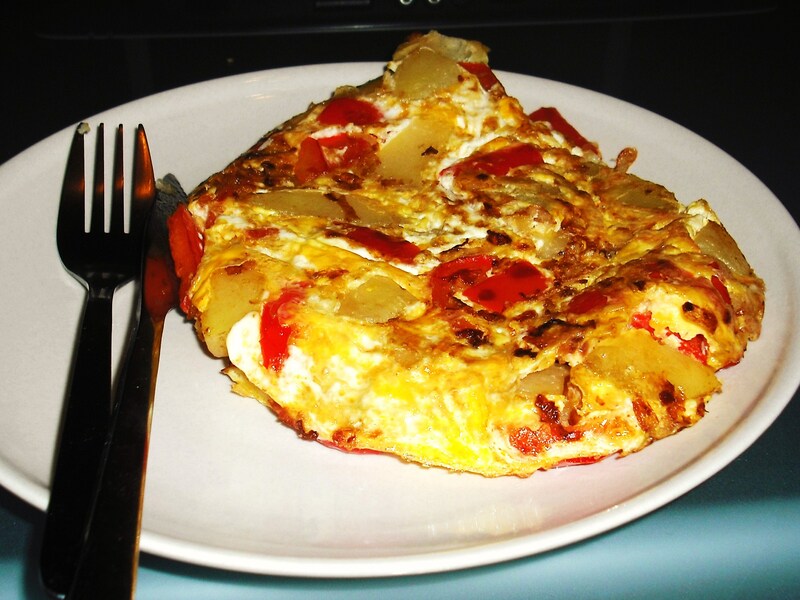 This entry was posted on October 14, 2012 by mixitupandmakeitnice in Egg, Food, Pepper, Potato, Shallot, Spanish omelette, Spanish tortilla and tagged Baking, dinner, Eating cheaply, Spanish omelette, Spanish tortilla, Store cupboard, Travel, vegetarian, Yummy!. Sweets for my sweet, sugar for my honey(comb)! Au revoir Bordeaux… until next time!